John Quincy Adams, sixth President of the United States, met the witty French writer Madame de Staël in Russia in 1812, and again in France in 1815. 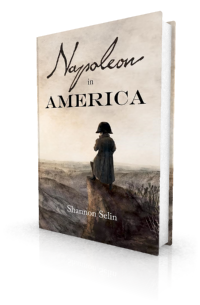 Though Adams admired her eloquence more than her logic, he found that on the subject of Napoleon, there was “no difference of sentiment” between them. Madame de Staël was born in Paris on April 22, 1766 as Anne Louise Germaine Necker. Her father, Jacques Necker, was a Swiss banker who became Louis XVI’s finance minister. Her mother, Suzanne Curchod, established a brilliant literary and political salon in Paris. Young Germaine was known for her conversational wit. She later hosted her own lively salon, frequented by liberal intellectuals. In 1803, Napoleon banished Madame de Staël from Paris. She spent much of her exile at Château de Coppet, in Switzerland. Her home became a centre for Napoleon’s opponents. Hounded by Napoleon’s police, Madame de Staël fled to Austria in May 1812, and from there to Russia. She reached St. Petersburg in August, having gone out of her way to avoid Napoleon and his troops, who were advancing towards Moscow. As requested, John Quincy Adams went to the Hôtel de l’Europe, where Madame de Staël was staying. He described the visit in a letter to his father. I went accordingly at the hour appointed and upon entering the Lady’s salon found there a company of some fifteen or twenty persons, not a soul of whom I had ever seen before. An elderly gentleman in the full uniform of an English general [William Cathcart, the British ambassador to Russia] was seated on a sofa; and the Lady, whom I immediately perceived to be Madame de Staël, was complimenting him with equal elegance and fluency upon the glories of his nation, his countryman Lord Wellington, and his own. The Battle of Salamanca and the bombardment of Copenhagen were themes upon which much was to be said, and upon which she said much. When I went in, she intermitted her discourse for a moment to receive me and offer me a seat, which I immediately took, and for about half an hour had the opportunity to admire the brilliancy of her genius, as it sparkled incessantly in her conversation. There was something a little too broad and direct in the substance of the panegyrics which she pronounced to allow them the claim of refinement. There was neither disguise nor veil to cover their naked beauties; but they were expressed with so much variety and veracity that the hearer had not time to examine the thread of their texture. Lord Cathcart received the compliments pointed at himself with becoming modesty, those to his nation with apparent satisfaction, and those to the conqueror of Salamanca with silent acquiescence. The Lady insisted that the British was the most astonishing nation of ancient or modern times – the only preservers of social order – the exclusive defenders of the liberties of mankind. To which his Lordship added that their glory was in being a moral nation, a character which he was sure they would always preserve. The glittering sprightliness of the Lady and the stately gravity of the Ambassador were as well contrasted as their respective topics of praise; and if my mind had been at ease to relish anything in the nature of an exhibition, I should have been much amused at hearing a French woman’s celebration of the generosity of the English towards other nations, and a lecture upon national morality from the commander of the expedition to Copenhagen. He and all the rest of the company immediately afterwards retired, and left me tête-a-tête with Madame de Staël. Her subject respecting America was to tell me that she had a large sum in the American funds, and to enquire whether I knew how she could contrive to receive the interest which she had hitherto received from England. I gave her such information as I possessed. She had also some lands in the State of New York, of which she wished to know the value. I answered her as well as I could, but her lands and her funds did not appear to occupy much of her thoughts. She soon asked me if I was related to the celebrated Mr. Adams, who wrote the book upon government [A Defence of the Constitutions of Government of the United States of America]. I said I had the happiness of being his son. She said she had read it and admired it very much; that her father, Mr. Necker, had always expressed a very high opinion of it. She next commenced upon politics, and asked how it was possible that America should have declared war against England [the War of 1812]. In accounting for this phenomenon, I was obliged to recur to a multitude of facts not so strongly stamped with British generosity or British morality as might be expected from the character which she and the Ambassador had just been assigning to that nation. The orders in council and the press-gang afforded but a sorry commentary upon the chivalresque defence of the liberties of mankind, and no very instructive lessons of morality. She had nothing to say in their defence; but she thought that the knights-errant of the human race were to be allowed special indulgence, and, in consideration of their cause, were not to be held to the ordinary obligations of war and peace. There was no probability that any arguments of mine could make any impression upon opinions thus toned. She listened, however, with as much complacency as could be expected to what I said, and finally asked me why I had not been to see her before. I answered that her high reputation was calculated to inspire respect, no less than curiosity; and that, however desirous I had been of becoming personally acquainted with her, I had thought I could not without indiscretion intrude myself upon her society. The reason appeared to please her. She said she was to leave this city the next day at noon. She was going to Stockholm to pass the winter, and then to England. She wished to have another conversation with me before she went, and asked me to call on her the next morning. I readily accepted the invitation, and we discussed politics again, two or three hours. I found her better conversant with rhetoric than logic. She had much to say about social order, much about universal monarchy, much about the preservation of religion – in which she gave me to understand she did not herself believe – and much about the ambition and tyranny of Bonaparte, upon which she soon discovered there was no difference of sentiment between us. But why did not America join in the holy cause against this tyrant? First, because America had no means of making war against him: she could neither attack him by sea nor land. Second, because it was a fundamental maxim of American policy never to intermeddle with the political affairs of Europe. Thirdly, because it was altogether unnecessary. He had enemies enough upon his hands already. What! Did not I dread his universal monarchy? Not in the least. I saw indeed a very favourable mass of force arrayed under him, but I saw a mass of force at least as formidable arrayed against him. Europe contained about 160 millions of human beings. He was wielding the means of 75 millions, and the means of 85 millions were wielding against him. It was an awful spectacle to behold the shock, but I did not believe, nor ever had believed, that he would ever be able to subjugate even the continent of Europe. If there had ever been any real danger of such an event, it was passed. She herself saw that there was every prospect of his being very shortly driven out of Spain, and I was equally convinced he would be driven out of Russia. It was the very day of the Battle of Borodino…. As to our war with England, I told her that I deeply lamented it and yet cherished the hope that it would not last long – that England had forced it upon us by measures as outrageous upon the rights of an independent nation, as tyrannical, as oppressive, as any that could be charged upon Bonaparte. [England’s] pretences were retaliation and necessity. Retaliation upon America for the wrongs of France, and necessity for man-stealing. We asked of England nothing but our indisputable rights, but we allowed no special prerogatives to political quixotism. We did not consider Britain at all as the defender of the liberties of mankind, but as another tyrant pretending to exclusive dominion upon the ocean – a pretension full as detestable, and I trusted in God, full as chimerical, as the pretension of universal monarchy upon the land. 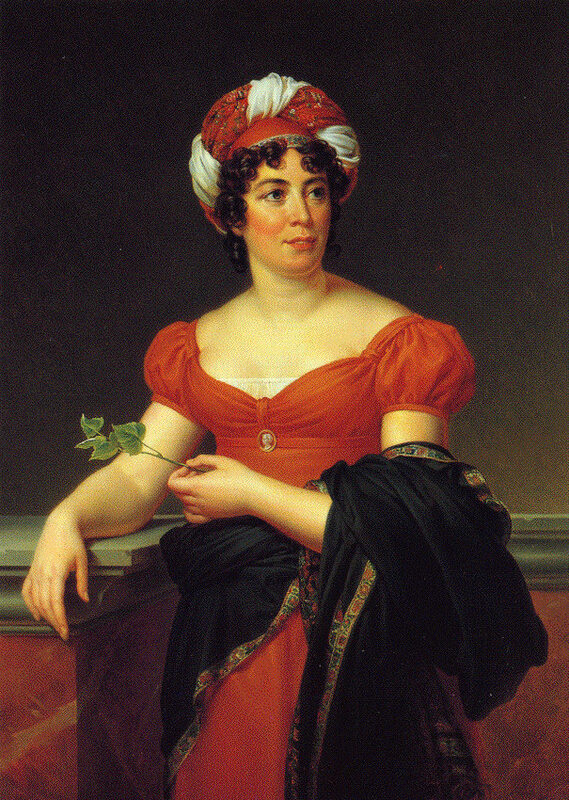 Adams called on Madame de Staël on February 8, 1815. He again found himself in a company of about 20 strangers. His hostess introduced him to French journalist Jean-Baptiste-Antoine Suard and an Englishman whose name he was unable to determine. They conversed on general topics. On February 15, Adams went to Madame de Staël’s for dinner. There were 17 people at the table, including Henry Clay, the Marquis de Lafayette, and the French writer and political activist Benjamin Constant, who was Madame de Staël’s lover. They did not meet again. On February 26, Napoleon escaped from Elba. Upon learning he had landed in France, Madame de Staël fled to Switzerland. 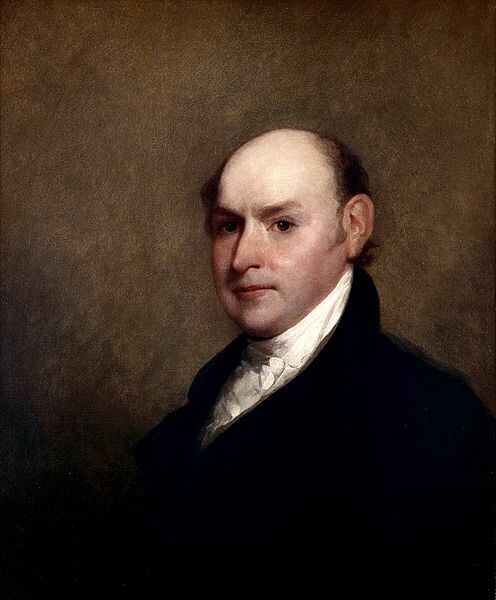 John Quincy Adams went to London to take up the post of US Minister to Britain. Madame de Staël died on July 14, 1817, at the age of 51. Gaspard Gourgaud, Talks of Napoleon at St. Helena with General Baron Gourgaud, translated and with notes by Elizabeth Wormeley Latimer (Chicago, 1904), p. 244. Charles Francis Adams, ed., Memoirs of John Quincy Adams, Vol. II (Philadelphia, 1873), p. 399. “To John Adams from John Quincy Adams, 16 February 1797,” Founders Online, National Archives, last modified June 29, 2017, http://founders.archives.gov/documents/Adams/99-02-02-1857. “To John Adams from John Quincy Adams, 22 March 1813,” Founders Online, National Archives, last modified June 29, 2017, http://founders.archives.gov/documents/Adams/99-03-02-2265. Memoirs of John Quincy Adams, Vol. II, p. 401. “From John Quincy Adams to Abigail Smith Adams, 21 February 1815,” Founders Online, National Archives, last modified June 29, 2017, http://founders.archives.gov/documents/Adams/99-03-02-2779. Charles Francis Adams, ed., Memoirs of John Quincy Adams, Vol. III (Philadelphia, 1874), pp. 155-156. Extraordinary asset protection in time of war. John Quincy Adams appears to have the photographic memory. Nice example of early 19th century diplomacy. I think John Quincy Adams did have an excellent memory. He was also in the habit of writing things down at the end of the day. He talks in his diary about his meetings with Madame de Staël, though he goes into more detail in the letter to his father. One might take, from the tone of the whole letter, that Adams is saying that SHE found no difference, not necessarily that HE, Adams, found no difference. The Madam is not one of my favorite people and I think Adams and I would find no difference on that point. Thanks, Addison. You may be right that Adams intended that comment to be ironic. Just seven months later, however, he wrote to his mother: “The conflagration of Moscow, and the sufferings of the Russian Empire under the formidable invasion of the last summer were awful visitations of Heaven, but they have been succeeded by prosperities and successes without example in modern history. The iron-Crown of Napoleon, and his Imperial Crown too, will henceforth be but crowns of thorns to him. His violence and injustice are recoiling upon his own head.” (“From John Quincy Adams to Abigail Smith Adams, 7 April 1813,” Founders Online, National Archives, last modified June 29, 2017, http://founders.archives.gov/documents/Adams/99-03-02-2274.) That sounds in keeping with Madame de Staël’s view. She had much to say about social order, much about universal monarchy, much about the preservation of religion – in which she gave me to understand she did not herself believe – and much about the ambition and tyranny of Bonaparte, upon which she soon discovered there was no difference of sentiment between us.